Moscow City Hall and representatives of the opposition coalition Solidarity agreed to hold the rally named ‘Spring Anti-Crisis March’ on March 1 in the district of Maryino in the southeast of the city, the head of the Moscow Directorate for Regional Security, Aleksey Mayorov, told reporters. He also said that additional consultations with the organizers of the event would take place later this week. 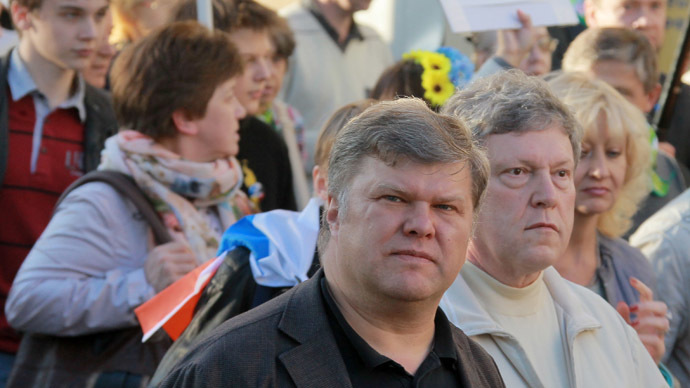 One of the leaders of the RPR-PARNAS party, Boris Nemtsov, reported that the activists had agreed to the place and time suggested by City Hall. The planned maximum number of participants remained as it was in the initial request – 100,000 people, he added. “The most important thing for us is to be heard by all city folk, including the residents of such large district as Maryino,” Nemtsov said. In the application for the rally opposition activists announced that their demands would include further easing of new parties’ access to participation in elections and granting the opposition movements one hour of airtime per week on one of the federal TV channels. The main claim is that the Russian authorities allegedly failed to secure the economy against the current crisis during years of economic prosperity. However, one of Russia’s oldest political parties – Yabloko – announced that it would not participate in the Spring March, citing the remote location as the main reason. Party Chairman Sergey Mitrokhin told reporters that Yabloko would decide on the format of the upcoming event at a special conference due on February 28. Mitrokhin earlier opposed the idea of the Spring March altogether, claiming its agenda was imprecise and urging his allies to concentrate on the anti-war ideas. One of co-founders of the Solidarity coalition, Sergey Davidis, said his colleagues accepted the Yabloko leadership’s decision with respect, but also hoped that ordinary members of the party would participate in the common march. The Spring March will take place without the key opposition figure – founder of the Party of Progress and renowned anti-corruption blogger Aleksey Navalny. On February 19, a district court in Moscow ordered the activist be placed under administrative arrest for 15 days over repeated violations of the law on public political events. A separate march called ‘The Red Spring’ will also take place on March 1 on Tverskoy Boulevard in the city center. The rally, organized by the Communist Party and several allied movements, would concentrate on the performance of the government in crisis times.